Click on title to view photo in large format. 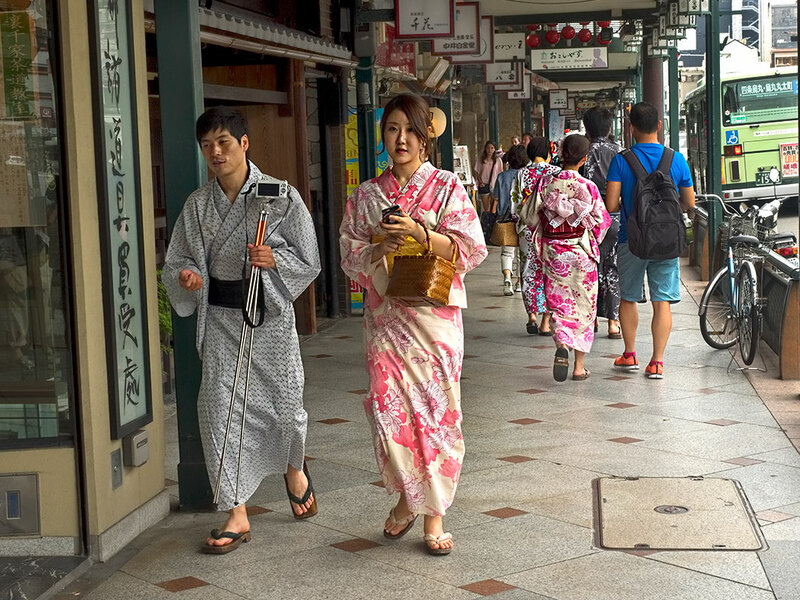 Many Japanese still wear the traditional Yukata, a casual cotton version of the more formal silk Kimono, as everyday attire. I found this to be so in Kyoto more than in any other place I visited in Japan. The streets were full of Yukata-wearing men and women. And while those in the city center were likely authentic, I learned that many Japanese rent their ensembles at one of Kyoto’s ubiquitous Kimono rental shops. For a price between 3,500 and 6,500 Yen ($32-61), both men and women can be outfitted in the cotton undergarment, robe, obi (belt), wooden sandals, hand fan, and a carry bag that makes up the national costume. Additional fees buy traditional Japanese hairstyles and location photos. It is even possible to hire a professional photographer to follow you around all day, documenting your experience. Once dressed, these Yukata-for-a-day customers stroll around Kyoto’s beautiful temples, stopping every few feet to pose for photos. It wasn’t long before I could easily pick out those who had rented costumes. They minced their steps, struggling to negotiate slopes or steps in the cumbersome wooden sandals. By the end of the day, many were barely hobbling along, obviously in great pain. The practice of renting a traditional Yukata is not limited to Japanese. Tourists have seized upon the practice as a way to have an authentic experience in Japan. Some tour companies are even including the experience in their packages. And I must confess that I, too, became a fan of the Yukata. My Ryokan (traditional Japanese guest house), provided me with one to wear while on the premises, thankfully without the requisite wooden clogs. It was without a doubt the most comfortable robe I have ever worn, and if I’d had room in my tiny suitcase, I would have purchased one. Yukatas are sooo comfortable, I agree. Have 3, which I happily wear at home in the summer. Since they are so lightweight, I also take one along when visiting a friend’s home as a convenient bathrobe. Hi Zenaida: I’m still kicking myself that I didn’t buy one!